MADISON, Wis. — No. 23 Wisconsin bounced back from a devastating loss to maintain its hopes of a West Division title and a return to the Big Ten championship game. Jonathan Taylor rushed for 159 yards and Taiwan Deal ran for 111 yards and two touchdowns as the Badgers took advantage of five first-half turnovers to rout Illinois 49-20 on Saturday. Wisconsin (5-2, 3-1 Big Ten) was coming off a 38-13 loss at Michigan that buried its national championship hopes. Next week the Badgers face a division matchup at Northwestern (4-3, 4-1), which rallied to edge Rutgers 18-15 on Saturday. The Badgers have played in five of the seven Big Ten championship games, losing their last three appearances in Indianapolis, including a 27-21 loss to Ohio State last season. “Indy is still in front of us. We can control all that by just winning football games,” Wisconsin offensive guard Michael Deiter said. The Badgers opened with an 11-play, 75-yard scoring drive, capped by Ingold’s 1-yard run. On the ensuing possession, linebacker T.J. Edwards returned an interception 28 yards to the Illinois 25-yard line and two plays later freshman Aron Cruickshank scored on a 23-yard jet sweep to put Wisconsin up 14-0. Illinois was 2 of 12 on third downs and all three interceptions occurred on third down. Illinois: The Ilini entered with 1.83 interceptions per game, tied for fourth nationally, and picked off Hornibrook twice. They also came in leading the Big Ten in forced turnovers and were 12th in the nation. Wisconsin: Hornibrook completed 13 of 22 passes for 188 yards, but was intercepted twice and had a third negated by a defensive penalty. But, he was far better than his performance at Michigan, when he was 7 for 20 for 100 yards with two interceptions and a string of 12 consecutive incompletions. Hornibrook became the seventh player in Wisconsin history to pass for more than 5,000 yards and now has 5,157 for his career. 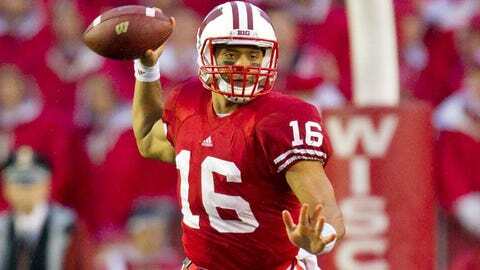 He needs 114 to tie Scott Tolzien for fifth on the Badgers’ career passing last. Wisconsin could move up slightly as at least one team ranked higher lost, but it’s hard to overcome the lopsided loss to Michigan and an early season upset at home against Brigham Young. Illinois committed only five turnovers in its first six games. Wisconsin trails Northwestern by a half-game in the West Division and plays the Wildcats on the road next week.